The Real State of the Union………………….The United States in decline. A new report from Freedom House, an independent watchdog that monitors freedom and democracy across the world, contains some disturbing information about the status of democracy in America under Donald Trump. 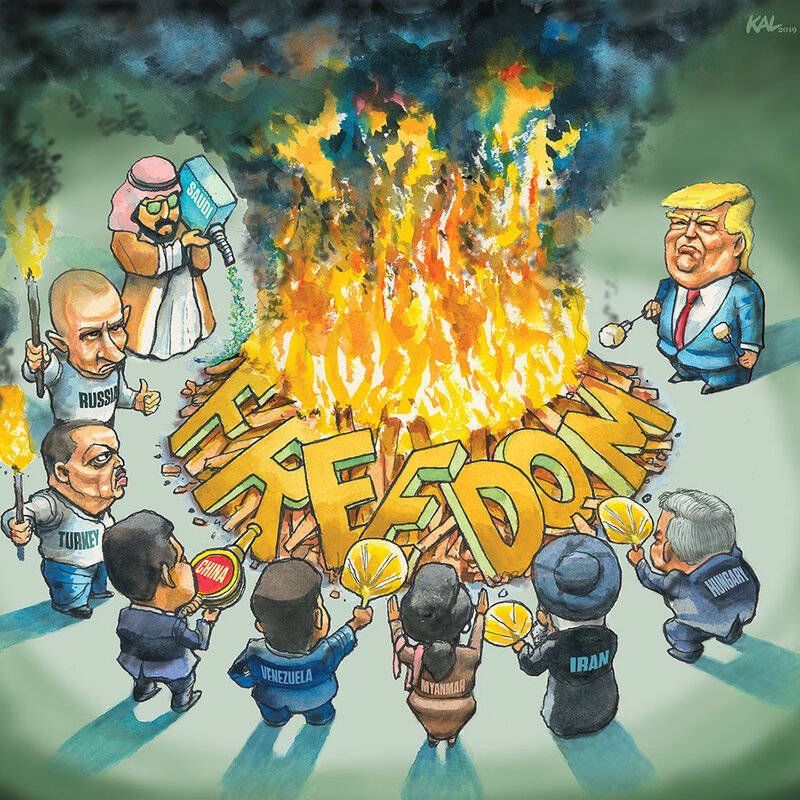 The organization’s 2019 “Freedom in the World” report claims that freedom in the United States has continued to backslide under Donald Trump and his brash challenges to democratic norms and American traditions. The story states that officials don’t know what to make of the Trump Administration that veers wildly from policy to policy and, at times, they aren’t even sure who in the U.S. government they should be addressing their concerns to. Most worrisome, are Trump’s tweets and proclamations attacking NATO that has allies worried about the future of the mutual defense organization whose mission is to fight back against military aggression — particularly from Russia. The Washington Post reports that German Chancellor Angela Merkel, British Prime Minister Theresa May and French President Emmanuel Macron have all been baffled on how to deal with Trump, and now just warily live with him and hope he doesn’t do too much damage. According to a French official, the president is just as belligerent in private as he is in his public pronouncements. This entry was posted in Freedoms, Tyrant Trump and tagged authoritarianism, Corruption, Crime, Cronyism, Freedoms, Trump, Tyrant Trump. Bookmark the permalink. Belligerent, for sure. But that chin way up in the air, and the haughty look, Look at some old tapes on Mussolini. Obama had a habit of putting his chin up in the air. Look it up…. Here are some consequences of what Freedom House has laid out in this summary of trump’s actions in regard to our long alliances with Europe. French President Macron and Germany are calling for a “true European army, because of trump’s contempt of all things European, with NATO at the top of his list. European countries are uniting by developing new weapon systems of their own, Germany’s Leopold IITank is now considered the best in the world. Czech, Romanian, and the Dutch Armies are now integrating into an all European Force. They are collaborating on a new fighter jet ready by 2035.
trump backing away from Europe is the driving force behind this common military buildup. In so doing he has isolated us from our strongest allies. This man is a wrecking ball on the institutions that bind us to the rest of the world. He is so unpredictable and very possibly unstable that we have lost the trust of much of the world. Isolationism is the worst path forward in times like we find ourselves. A walled off country can not survive and it only creates a siege mentality from within. It is a medieval approach to a modern world. We are dealing with a cancer on our body politic. This is not a chess game folks. So…Trump has forced European countries to step up and defend themselves, and that’s a bad thing? When you have to defend yourselves from Russian interference/intervention/invasion, YES, that is a BAD thing, you Trumptarded moron! Go get your GED first, fascist fool, then come back here to rejoin the discussion! Of course it is a bad thing when you shun military defense alliances that have maintained the power to balance Russia and others from destabilizing a shaky world. With trump at the wheel we a left to go it along. Dumb idea.